My ultimate salad bowl duel. 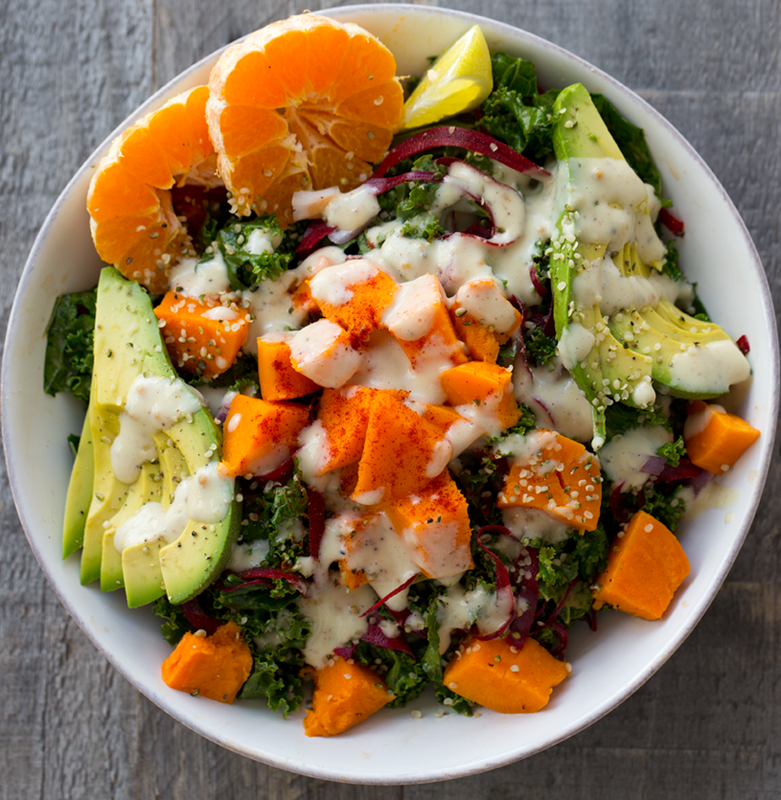 Avocado and sweet potato facing off on a bed of kale. Boom. 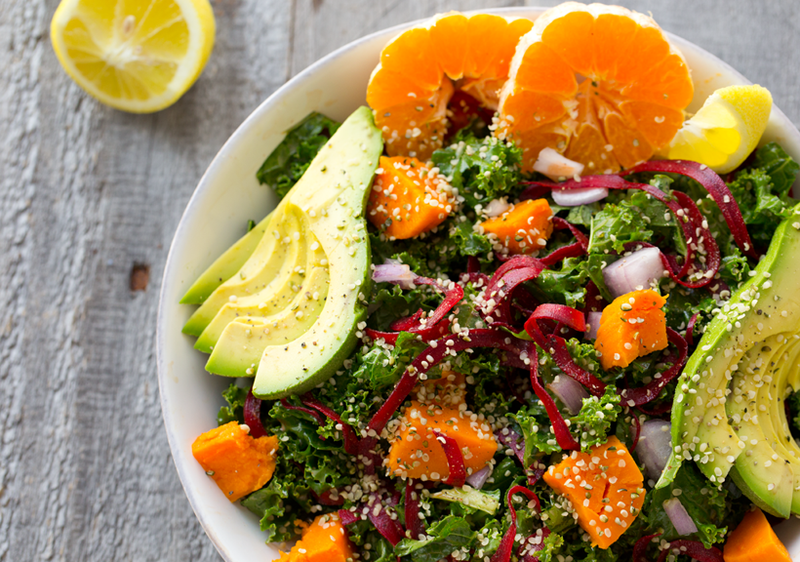 For my Dueling Avocado + Sweet Potato Kale Salad, buttery avocado mingles with caramelized cubes of golden sweet potato, ribbons of beets, protein-rich hemp seeds and a creamy vegan dressing with spicy, sweet, smoky flavors. Aside from this amazing salad, another one of my obsessions lately is the Broadway musical Hamilton. Anyone else? ..Though I have yet to actually see Hamilton on stage, (I mean $500+ $900+ a ticket and sold out status until January 2017 is a pretty tough challenge), I am obsessed with the music and have been playing it nonstop while I work. The Broadway recording is available on iTunes. And you can also watch rad clips on YouTube to quench your Hamilton/Burr thirst. The Hamilton YouTube channel is a lot of fun. And I am not giving up on my ticket snagging dreams. Ticket prices have to go down a little, right? Maybe?. Hamilton music makes excellent work music. Or kitchen meal time music. Or road trip music! I really love this time of year. Music comes back on more often in my workspace as I cook, work and shoot videos. I love the spring breeze that floats into the kitchen and my sleepy kittens lounge by the window watching birds swoop by. And this salad has been a springtime go-to dinner for me. It is similar to my recent Eureka bowl, only a bit simpler in ingredients and more heavy handed on the avocado and sweet potato. I hope you give it a try. You can also make a dueling salad spin by choosing two of your fave ingredients and have your own salad duel. Question of the Day? What are your two fave, must-have salad ingredients?? Two dressing options. A super flavorful maple-mustard dressing (video below) - or go with a creamy vegan ranch. 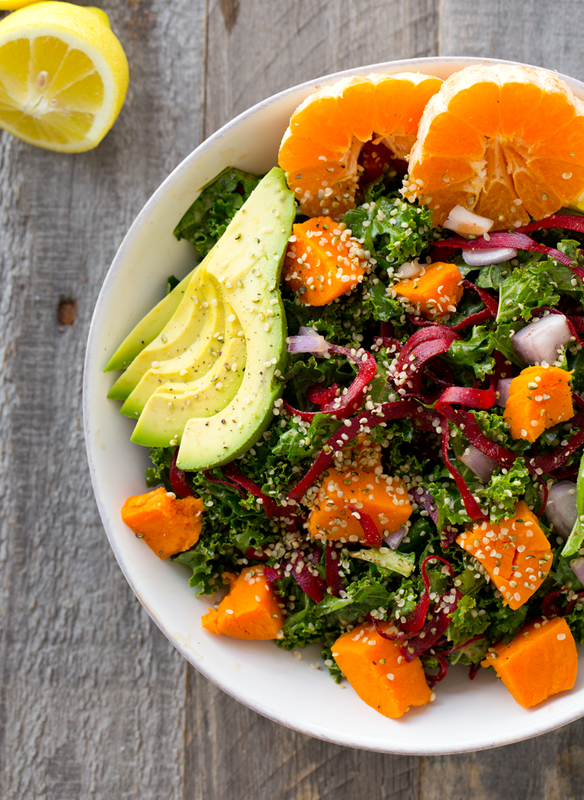 This salad packs so much goodness in one big bowl. Vegan protein from those buttery hemp seeds and all the veggies. Loads of fiber. Healthy fats. Vitamin A and potassium. Leafy green goodness from nutrient dense kale and a creamy dressing on top. 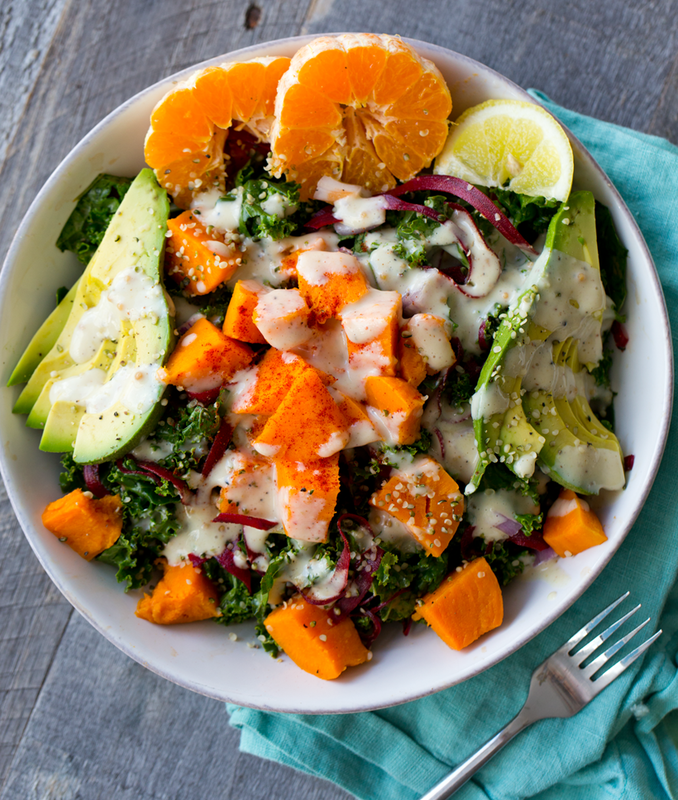 Sweet potato and avocado over a bed of kale, and a creamy maple-mustard dressing. Vegan bowl meal. Preheat oven to 400 degrees. Poke a few holes in your sweet potato using a fork or knife. Bake for 30-50 minutes or until tender and caramelized. Allow the potato to cool a bit before handling. (You can also bake the potato a day ahead of time, store in the fridge, and re-warm or serve it cubed and chilled). -- Speedy version: microwave sweet potato until tender, or peel and boil large cubes. Whip up the dressing by whisking all the ingredients together in a small bowl. Add the kale, onions and beets to a large mixing bowl and toss with 1-2 Tbsp of the dressing. Assemble Salad. 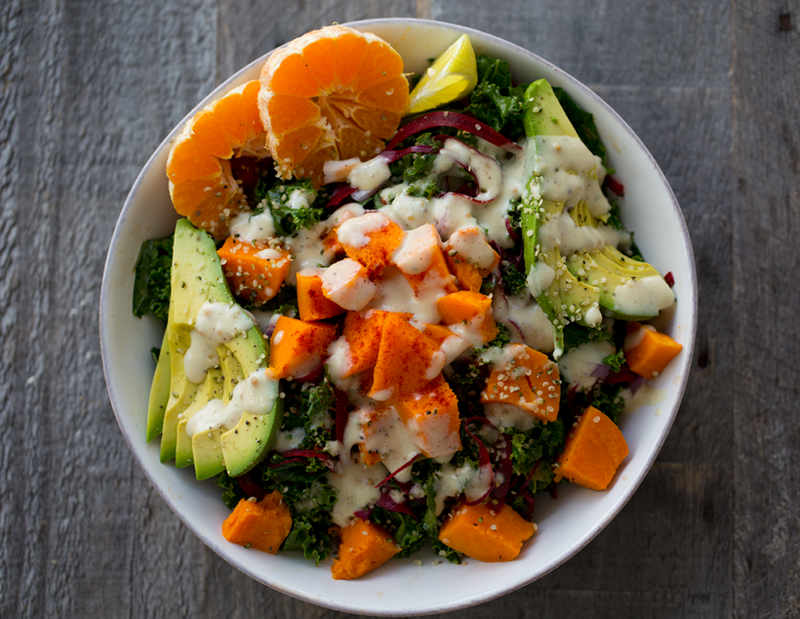 Add the kale mixture to your serving bowls. Followed by the avocado fans. Dice the cooled, but still warm sweet potato and add in generous piles to the salad. Sprinkle hemp seeds over top. 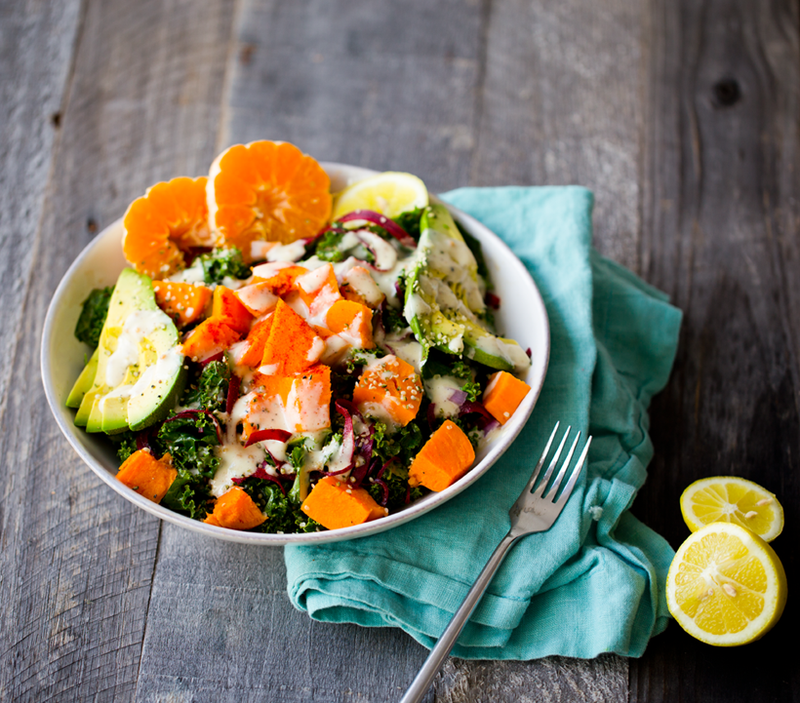 Add the citrus to the side of the salad. Then drizzle as much additional dressing as you want over top the salad. You can also add additional hemp seeds if desired. Serve with lemon slices. I like to serve with some toasted bread and make DIY avocado toast as I eat the salad. Also optional: sprinkle smoky paprika and nutritional yeast over top to serve.